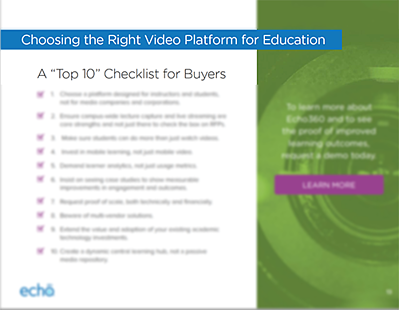 Selecting a video platform to effectively support teaching and learning is different than choosing one for your campus website or sports programs. To drive student success, colleges and universities need a video platform that is designed to enhance and support the educational process and foster stronger connections between learners and instructors. If you want to future-proof your video investment and maximize its impact on student success, here are ten critical evaluation criteria to ensure you will get the most from your educational technology investment. Fill out the form and click submit to get your free copy!